This is not your ordinary garlic bread. 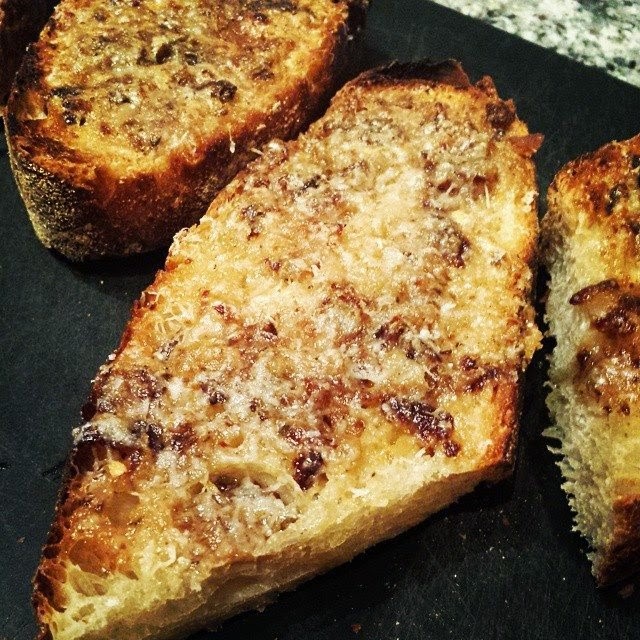 It is a decadent and luscious combination of Parmesan, confit garlic, butter, lemon and red pepper flakes. I could easily become addicted to this. My advice is to use the best Parmesan you can find for this bread. You won't regret it. I will add some fresh chopped parsley to the mix next time for a little more freshness. Enjoy! 1. Cook garlic in butter in a small covered saucepan over medium-low heat until golden brown and very soft, 15−20 minutes. Transfer to a medium bowl; let cool. 2. Add Parmesan, oregano, lemon zest, and red pepper flakes to garlic and mash to a paste; season to taste with salt and pepper. 3. Heat broiler. Slice baguette in half lengthwise, then crosswise. Broil, cut side down, on a foil-lined baking sheet until golden brown, about 2 minutes (watch carefully). Let cool slightly, then spread cut side with garlic paste. Broil until cheese is golden and bubbling, about 2 minutes. Slice. How is this adapted? Okay, you used dried oregano (and adjusted proportion) instead of fresh, as in recipe. Why don't you just write that this is from Bon Appetit? Because the recipe is not exactly as it appeared in Bon Appetit, I said it was adjusted. Its a respect thing. I'm not taking credit for the recipe.